Oh man, I recently had my first run in with the ol’ Brown Tail Moth, and I am definitely one of the lucky ones that react in terrible ways to even the slightest contact with the little guys. I was staying in a camp on a lake near Camden, Maine for a wedding two weeks ago. We stayed 2 nights and the first morning I noticed a little itchiness on my left wrist and red dots appeared, an hour or so later I noticed more red dots on the left side of my stomach, and then another hour later I spotted the brown caterpillars each with two orange dots on their backs. I busted out my phone because just a few days earlier I had shared a graphic with the four common caterpillars that folks would be seeing here in Maine. Sure enough brown with orange dots was the bad one and came with a warning. I could only assume that my itchiness had to do with the caterpillars that were hanging out on the camp porch handrails. Brown Tail Moth Caterpillars molt five times within a few months period starting in May. The fibers that they molt remain toxic for up to 3 years. Be wary opening up camps in infested areas because the fibers settle out of the air over the winter (which I think may have been a factor in my case). The caterpillars prefer Oak and Apple trees. Not everyone has a reaction (thank goodness, I just couldn’t bare to image my 2.5 year old or 11 month old dealing with that amount of itchiness) and have no idea how I would deal with either of them in that situation. They are invasive, so go ahead and kill them. For treatment, I read that there is really nothing you can do to stop the reaction but manage the itch with the regular old over-the counter itch stuff (hydro-cortisone, calamine lotion etc) and that many pharmacies make up their own concoction to treat the itch that includes Benadryl. And finally, to call poison control if the situation is really bad and you need to know if you should go to the emergency room. Well, my situation was definitely not emergency room, that first day it was just mildly annoying, so I just didn’t do anything about it. Overnight was different story, it spread and was at times unbearable. I think that during the day, I had managed to stay busy and just ignore it. I put a salve on the rash that contained calendula, yup – my homemade diaper rash cream, so maybe that lulled me into a false sense of complacency. But that night I had to use my hypnobirthing breathing exercises to fall back asleep after getting up to nurse in the middle of the night. The itchiness was unbearable and the rash grew to cover 1/3 of the front half of my body. When I got home the next day I was a bit desperate to do something about it. A friend at the wedding that I had just been to mentioned an Arbonne product that was good for itchiness because it contained clay, which is known to draw out toxins. This conversation was before my itchiness started, but it stuck with me, and although I did not have that product on hand. 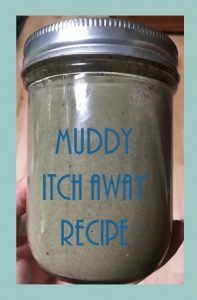 I did have some bentonite clay in my cupboard and as it turns out, most of the other ingredients that I found in this recipe on the Dr. Axe website for an herbal itch relief salve. I am not really familiar with this website, but their explanation on the purpose of all the different ingredients made sense to me, so I decided to dive in an quadruple/alter the recipe to fit with my ingredients. Once I had the muddy mix ready, I slathered it on the affected area repeatedly for a day or so, and it worked! This was not a scientific experiment, I did not compare to over the counter or pharmaceutical options, but I will definitely be going this route if I run into these caterpillars again. Luckily we only have one Oak tree on our property, and no apples! My other tactic to solve the problem was to reduce exposure, I had a friend pick up a lint roller for me, and I rolled everything that went to Camden with us to remove the fine fibers. I threw everything in the washing machine that could be washed, and my wonderful husband vacuumed out the truck for me. I plan on putting a lint roller in every car, the camper and a few around the house. This happens to be our second run in with caterpillar fibers in the past year, my son picked up a wooly cocoon last summer, and well, lets just say that did not go well. Through that experience I learned that you can use the roller on your skin too to stop the spread of the fibers. This made quite a big batch, but I was able to use it liberally and as often as I liked without fear of running out this round, and I am also ready if this happens again or for any itchy reaction that’s bugging anyone in the family. I only made this recipe the one time, so I have not gone back and followed my written instructions to make sure that they make sense. If you have any questions, please let me know or you can refer back to the original recipe here. Melt the coconut oil and shea butter over low heat. Use a double boiler or a quart mason jar sitting in a few inches of water in a pot. Add the dried calendula and chamomile to the oils. Place a lid on the mixture and keep the pot over low heat for 20 minutes to an hour, depending on how desperate you are for itch relief. Put cheesecloth in a sieve and filter the herbs from the oil into a bowl that you can set the sieve on to drain. You can discard the herbs and the cheese cloth. Wipe down the double boiler or the quart jar, so that bits of herb are removed and pour the filtered oil back in. Return the heat to low and add the honey and stir. Remove the mixture from the heat and add the baking soda, bentonite clay, witch hazel and apple cider vinegar. Continue to stir. Now add the peppermint, tea tree oil essential oils and stir. Allow it to cool, then transfer the cream into a jar with a tight-fitting lid or just let the mason jar cool if that is the method that you used. As soon as the mixture is cool enough to touch, use it! My apologies for all of the run-on sentences, lack of organization and grammatical errors in this blog post. I have a million drafts just as drafty as this one, but the urgency of sharing this info made me throw out the quality-controls and share. I hope I get back to spruce this up soon, in the mean time just take it with a grain of salt. Thanks! This entry was posted in Cookery by beettheratrace. Bookmark the permalink. bef᧐re. Ѕo good to discover someone with some unique thoughts on this t᧐pic. Really.. many thanks for starting tһis up.